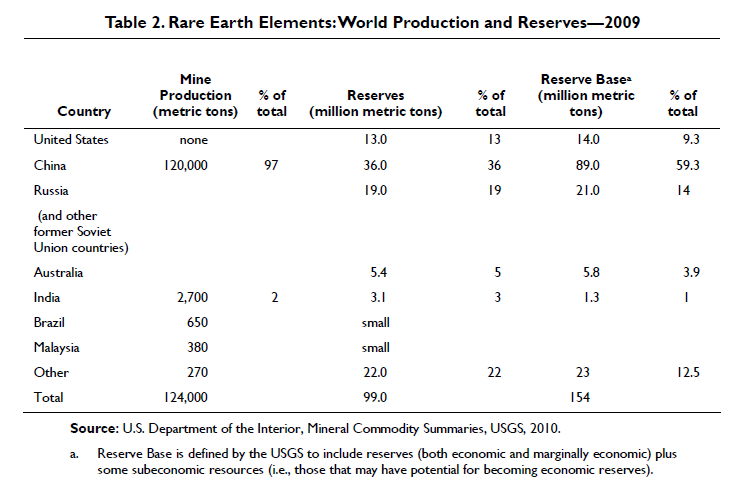 The Rare Earth Question: Confront China or Not? 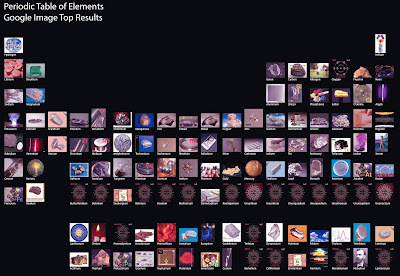 Periodic table of nonsense: Fengshui, astrology, etc. total GDP of China (in PPP) could be comparable to that of US in 15-20 years, in an optimistic scenario. Now the Economist projected it to be around 2019, one year ahead of my optimistic scenario. I still think the Economist is a bit to optimistic. The Economist is very good in manipulating charts. In the past, it would make 120 appears twice as large as 110 by plotting the y-intercept at 100. Here is another innovation to mislead our readers. The US has 13 million tonnes of rare earth elements but it would take years to extract them, suggests the first detailed report on the country's supply. 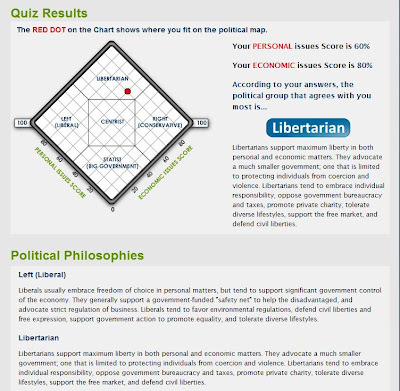 They said I am a "libertarian"
This is the quiz I took (via thebigpicture), and they said I am a "Libertarian"
He could have said, "I would like to take up this opportunity if it is okay for our Korean friends, since mine is also from Asia." What was Zhan Qixiong plan when he was intercepted by Yonakuni? This is the video taken by Yonakuni on the collision when it tried to intecept Minjinyu 5179. What would you do if you wre captain Zhan at this moment? Your boat is much slower than Yonakuni (10 knots vs 30-40 knots), so it is useless to go anywhere in front of it. 12-9 O'clock directions are ruled out. It takes some time for Yonakuni to make a u-turn so your best chance is go behind it. You cannot go backward. You probably arrived at this position and were planning to move forward. But you had to stop your engine because Yonakuni is cutting in front of you. Going backward will bring you closer to Huangwei Yu and bring you more trouble. You want to be as far away from Huangwei Yu as you can now. You options are anywhere from 3-12 O'Oclock. 12 O'clock (proceeding directly ahead) offer you the best chance to escape, because JCG H is behind you and may intercept you from behind on your right hand side Another reason to avoid your right hand side is that H probably is already at your 3 O'clock now. You see Yonakuni is moving, there are some 100-200m between you and Yonakuni, so by the time you reached its current position (Y0), it should have moved to Y1 already. So you took the short path, charging directly ahead to break the trap. M0 to M1. Yonakuni knew that and saw that. It braked/backpedaled and stayed at Y2 instead. You tried to avoid it but you still got to its tail. Should you have taken 1 O'clock or 2 O'clock instead to be safe (even if H is at 3 O'clcok coming to you)? You probably should, and you probably had done all those earlier that morning. This is one of the many interceptions since early morning and the ordeal would take at least another 2-6 hours that day. Maybe they have videos for you trying hard to avoid collision as well. They are not going to show the public if all the other videos. If not for that over-zealous and over-confident sengoku38 san, no one in the public will be able to even see this video. Maybe you should have made your own recording. But you cannot afford such gadgets, and were not prepared to bring a video-camera to this trip, After all, you are a poor fisherman trying to make some bugs. You are not coming here for eco-tour. Then you can find out the answer in this picture below (where the picture above is cropped from), taken from the end credit of the movie Suspect X (a great movie btw). I do not claim the situations are the same, but this just shows us how a partial picture is far from being a conclusive evidence. That is why I hope Japan would release all the 10 hours of videos it has taken. In my previous post an anomymous commentator suggested that Minjinyu 5179 made a change of direction and hence ram into Mizuki. 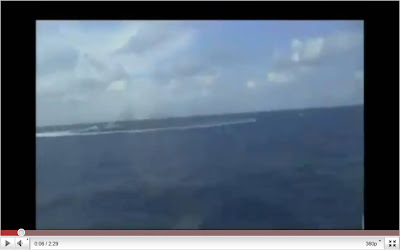 What he saw was the video taken from on board Mizuki, all it shows is the relative velocity. 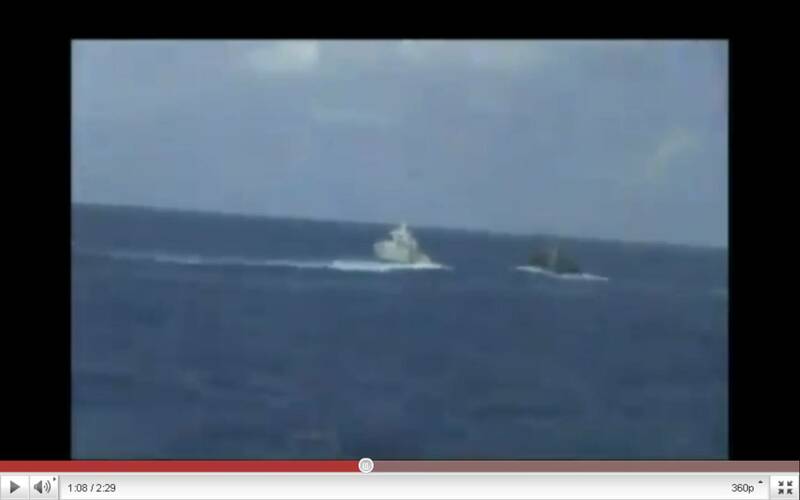 Fortunately, we are able to see another video taken by Hateruma during the exact same moment from a different angle. Here it is. A path with time scale based on the video, and the speed indicated by the intervals between the 10 second gaps is shown approximately here. 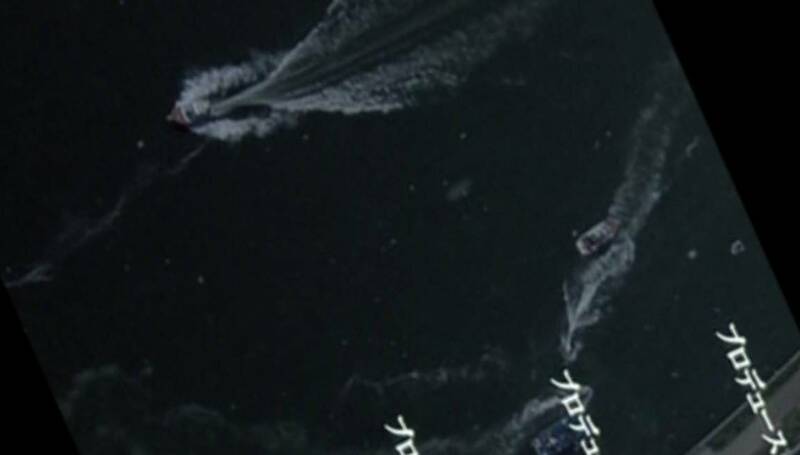 Looking at the time scale you can also see that Mizuki has more or less parked (stationary speed) for the 30 seconds before the collision, while Minjinyu had actually slowed down a bit. 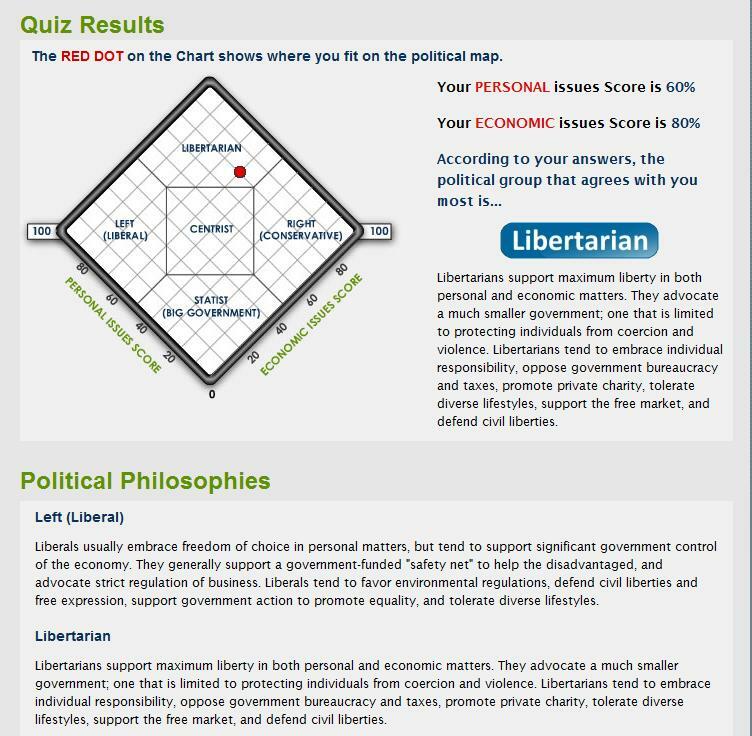 You can view the video again to verify my chart. 1B) Mizuki turned 90 degrees (1:10). 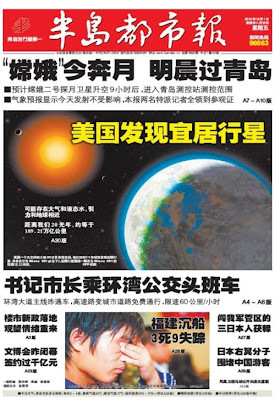 Note that Minjinyu 5179 has already made its turn of 20-30 degree by then. So Minjinyu's turn was made most likely while Mizuki formed a T in front of it. Perhaps it was expecting Mizuki to continue sailing towards its right, so that turning left would avoid the much faster Mizuki. 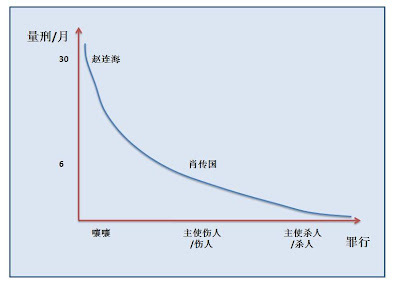 Since Mizuki is almost stationary while making the turn, we can estimate the speed of Minjinyu during the moments to be around its own length during 10 seconds. which is approximately 40m/10s or 4m/s=15km/hr. If you compare the location of Mizuki between 0:26 and 0:29, in less than 3 seconds it traveled the length of its own of 46 meters (type びざん型巡視船 (2代))(marked by the white wave). 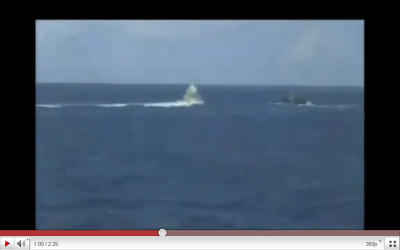 So its speed is about 50m/3s = 60km/hr, 4 times the speed of fishing boat 5170. So even adjusting for it slower speed right after the turn, it must be able to avoid the crash it wanted to. If this is still not conclusive, in the Mizuki video we can see two other JCG staff were taking videos, they should release those videos as well as additional data points. Now back to the video taken from Mizuki. The encircling tactic is not uncommon from JCG. This is an aerial photo from another act by JCG, probably taken in 1998 in the same area. This may be the plan of the JCG ships. See also a different view in this NBR thread, there are some problem with the poster's observation though, e.g. 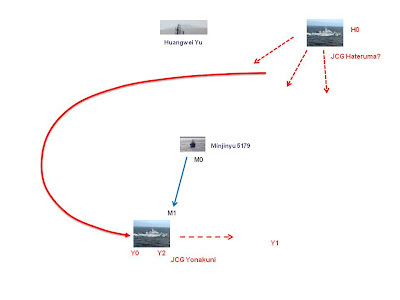 he claimed there were 2 JCG ships, in fact there were at least 3, the Yonakuni, the Mizuki, and the Kateruma. A chart of US interest rate plotted against velocity of Monetary Base/GDP looks strikingly similar to that of the map of Hanshu island, Japan. Not the Noto Peninsular in central north area of the island (north of Ishikawa), Shikoku/Seto Inland Sea area, Wakayam Peninsular are all well recognizable in the chart. 2) What was Zhan Qixiong plan when he was intercepted by Yonakuni? Some discussion in the comment. I would recap here. 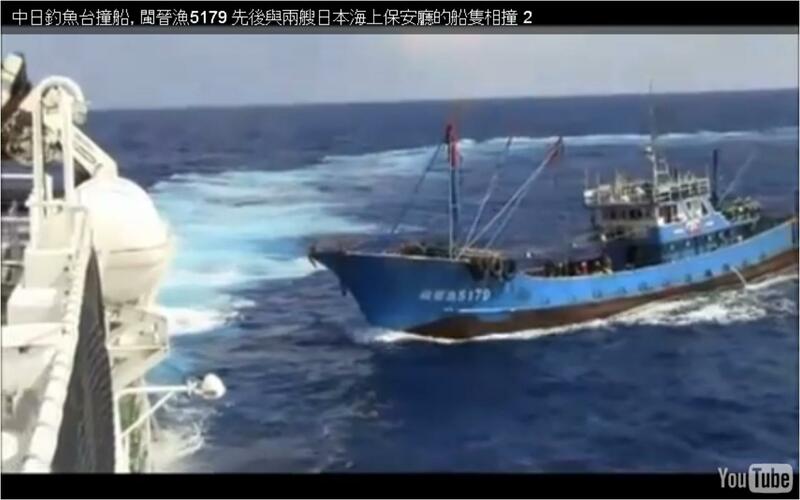 How the collision happened, and the routing of the JCG ships and the Chinese boat are pretty clear after viewing these videos. This is actually quite similar to the case of the Hainan flight collision between a Chinese fighter and American spy plane in April 2001. 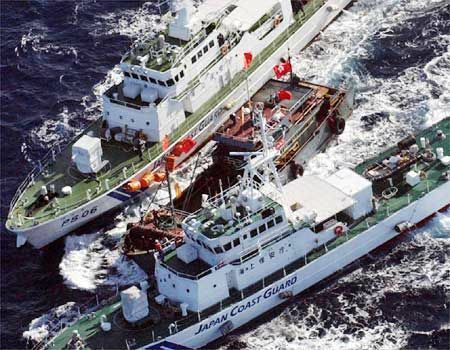 1) From Japan's perspective, the JCG is 'enforcing' its law in its water. 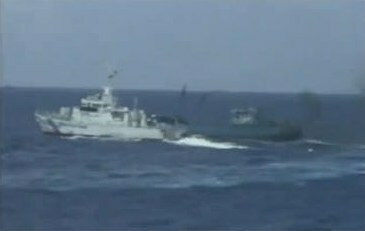 The question is comparable to whether a police boat should block the course of a civilian when it disobeyed order. And whether the enforcement should be as aggressive in certain disputed area with a foreign boat. 2) From Chinese perspective, Japan simply has no right to enforce its law in this area. 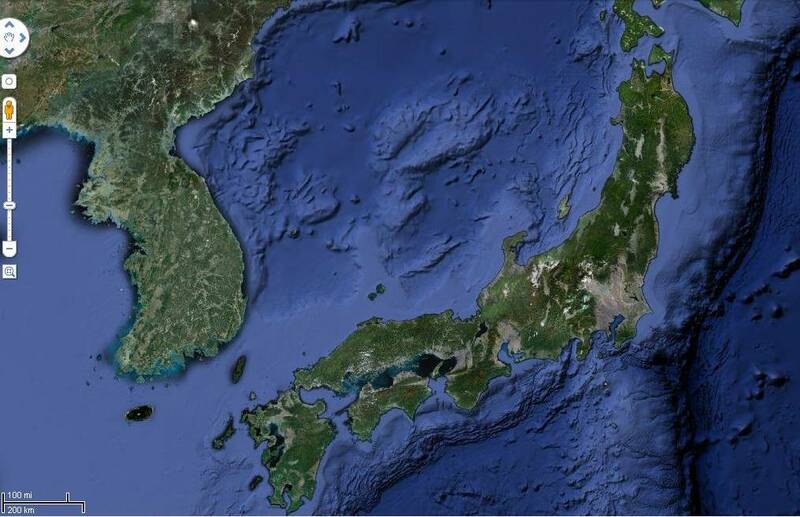 a) shall enforcement be this aggressive, assuming even if this area belong to Japan (as many Japanese would say, the Russian were much more aggressive, and opened fire in South Kuriles)? b) shall the fishing boat change course (or is it possible for it to do so technically, given it is much slowed to control the speed and direction of a boat than a car)? c) has the captain been avoiding such collision for the whole 4-5 hours of hide and chase game, and eventually lose either concentration or patience and gave up on steering control? 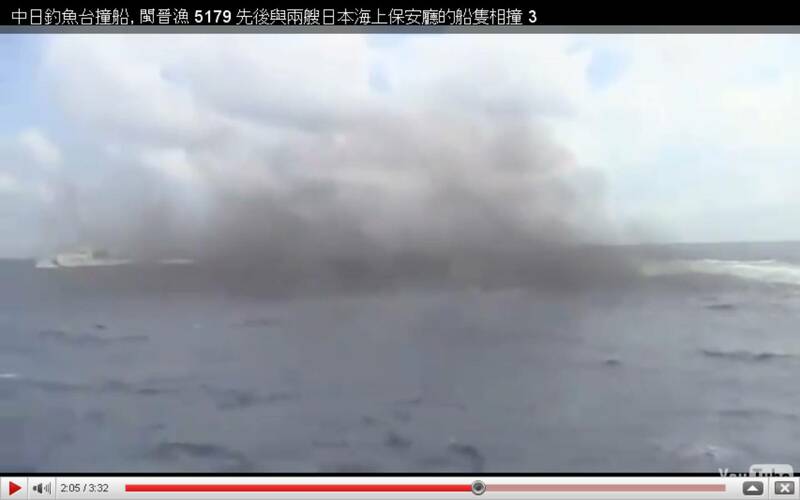 d) the area seems to be within 12 nm of the island (as you can see the islands in the background in Yonakuni video). so this is not the high sea. but again, it is disputed area and enforcement should be more scrupulous. 1) 282 DVDs discovered in JR Station, with leaflet of "This shows the truth about DPJ. Please help yourself for free"
2) Asahi's speculation of the rationale for the leak. 1) This is taken by crew on Yonakuni. 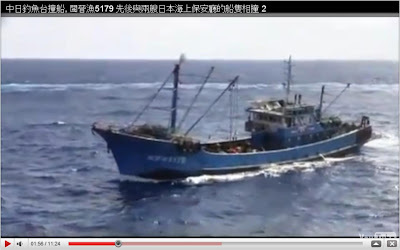 You can see Yonakuni started from the right flank of Minjinyu 5179, cut in front of it (and obviously doing this very slowly or even 'parked' in order to intercept the fishing boat). Minjinyu's direction did not change much throughout the video and its velocity was not fast and didn't change much. When the boats collide you can see the white wave track left behind by Yonakuni, showing that it had just crossed in front of Minjinyu. From the track you can see Yonakuni's speed was much faster than Minjinyu. 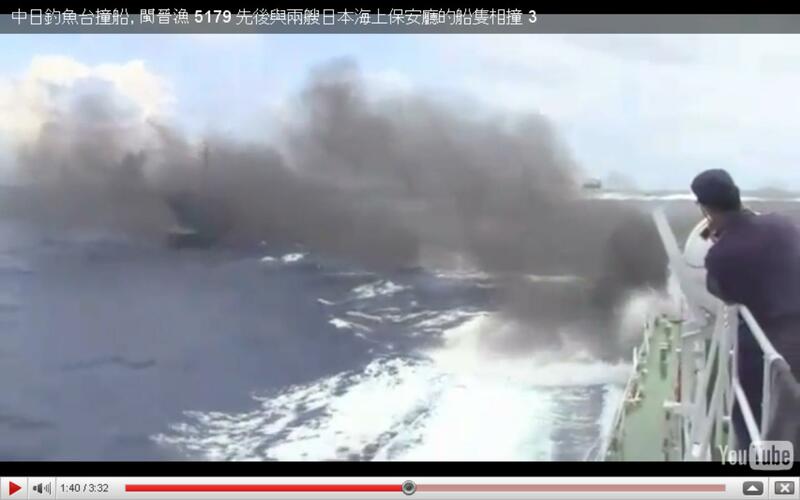 It makes one wonders why it slowed down (instead of sped up) while parked in front of Minjinyu. 1C) Right before collision, white track behind Yonakuni. Yonakuni has just made an almost 90 degree turn in front of Minjinyu. 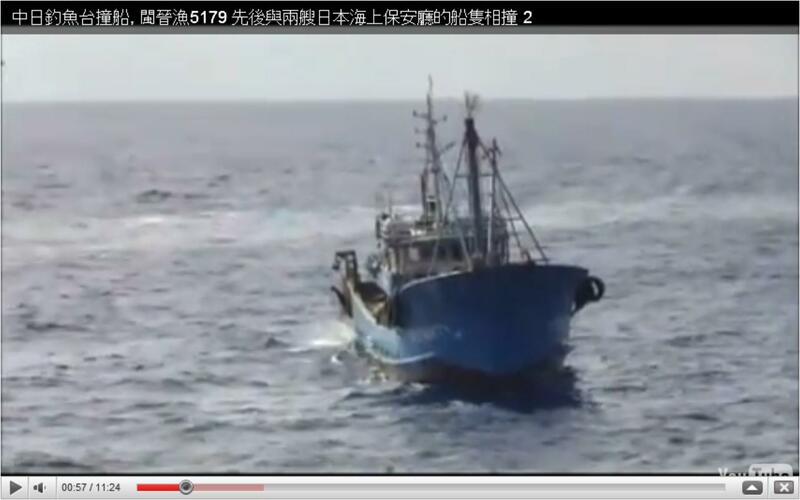 1D) After collision, no more white track as Minjinyu broke out of the "white circle". Compare this with earlier CGI released by Japan you will understand why CGI is preferred over the real thing for Japan. 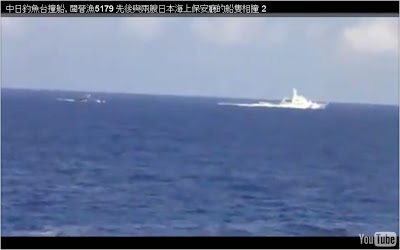 2C) Mizuki, reach in front of Minjinyu, turned again to block Minjinyu from its front, the next video starts here, filming the left side of Minjinyu. You can see that Minjinyu did not change direction, while Mizuki turned into its way. It is not clear whether Minjinyu would have enough time to change course, or if it did, Mizuki would not move again to block it. This is taken on Mizuki. It very clearly shows the JCG ship Mizuki sped up to intercept the Chinese Fishing Boat. In the beginning of the video, the two boats almost sailed side by side. Note also that a lot of black smoke came out from Mizuki a few seconds BEFORE the collision, similar to what you see when one pushes the pedal suddenly on a truck uphill. This is taken a second before the collision, Note the thick black smoke from Mizuki. The JCG boats seem determined to intercept the Chinese fishing boat. The Chinese fishing boat (Minjinyu 5179) seems determined to get out of the encirclement. 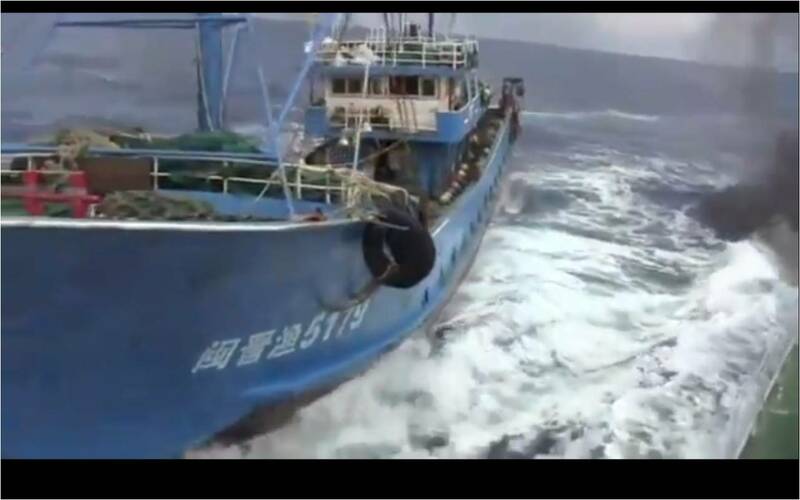 The JCG boats are 3 times in length (translates into 27 times in size/volume/tonnage - Yonakuni is 89 meter long, 1300 ton displacement, vs Minjinyu 5179's 30 meter length and about 40 tons in displacement) and much faster than the fishing boat. As I had earlier speculated, it is extremely unlikely that any sane skipper will want to run into ships 27 times its size with much stronger steel body, nor that a much slower fishing boat would be fast enough to chase up the JCG ship. This looks like a replay of the 2008 Lien Ho Incident. In short, these videos do not help with JCG's case against skipper Zhan. 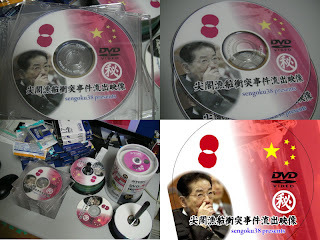 It explain why Japan had to release the captain. The Chinese MoFA spokesman Cui Tian Kai is now very adamant, "[Regarding what actually happened], The facts are very clear..."
So what did Ma Ying-Jeou say? In between the poles of union and separation, Ma said his government is prepared to discuss political agreements, including security issues, as soon as the priority economic issues are dealt with. He suggested that those political talks could start as early as a second four-year term if he wins re-election in 2012. "We are not intentionally delaying the talks on political issues. Certainly the economic ones are more important to people here. People also support the idea (of) economy first, politics later," said Ma. Asked if he would move to political talks in a second term once economic issues are dealt with, Ma said "it depends on how fast we move." Political issues, he said, "will come after all the major economic issues are resolved." concerns of the United States? islands. So I understand this issue well. AP: So is China trying to interfere with the open water policy? surveillance activities are normal and should be allowed? are rules. I think that each country should follow the rules. 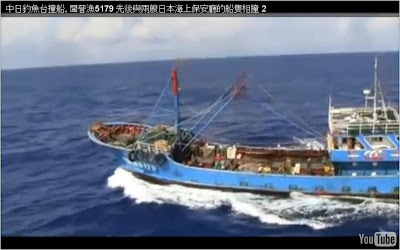 "China has lodged a solemn representation to the United States as the USNS Impeccable conducted activities in China's special economic zone in the South China Sea without China's permission," Chinese Foreign Ministry spokesman Ma Zhaoxu told a regular news briefing. "We demand that the United States put an immediate stop to related activities and take effective measures to prevent similar acts from happening," Ma said. Passage is not, and has never been, China's complaint. Especially, if it is passing in the open sea far away from its naval bases.China complained about the "activities", not the "passage". Mr Hutzler, you need to do your homework before an interview, and you need to go back to school to study how to write a report. Trying to tweet, link here. The link will also be posted on the right hand column, top of the "recommended reading" section. This is a great lecture on geopolitics, border of countries and trends and how to avoid border conflicts in future. You can also choose the subtitle in 12 different languages (a drop button in lower left corner), and view the subtitles as well (click interactive transcript). Enjoy! Replacing Oil Addiction With Metals Dependence? (Update) One note: many local papers falsely claimed that "China mines all 17 types of rare earths", or even "China is the only country that mines all 17 types". This is WRONG. 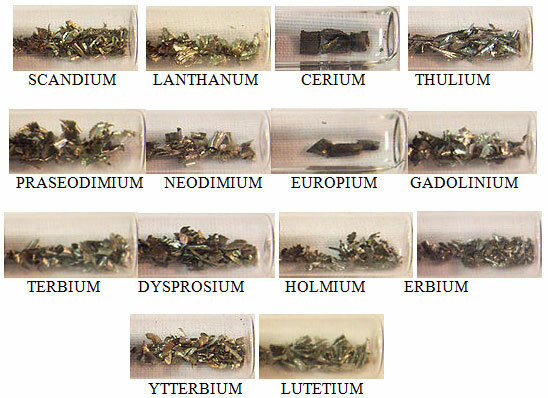 To start with, there are only 16 elements to be mined, the Promethium is radioactive and decays quickly (the most stable isotope of Promethium lose half of its atoms every 17.7 years). So, nobody, including China, mines Promethium. Watch Lisa Reisman on the alleged RRE "ban". Industry officials said that mainland China’s customs agency had notified companies that they were not allowed to ship to Japan any rare earth oxides, rare earth salts or pure rare earth metals, although the shipments are still allowed to go to Hong Kong, Singapore and other destinations. But no ban has been imposed on the export to Japan of semi-processed alloys that combine rare earths with other materials, the officials said. China has been trying to expand its alloy industry to create higher-paying jobs in mining areas, instead of exporting raw materials for initial processing. So if anything, China was just trying to extract more value-added. Since semi-processed alloys were exported with no disruption even from the NYT source. The alleged "ban" was merely second-handed distortion of the original report. 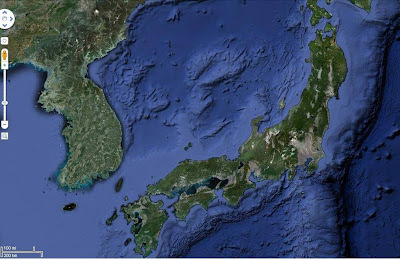 And Reisman was correct that it may well be a general slow down in anything send to Japan (till the end of September). Having reviewed this, it makes one wonders, if not for the rare earths, what made Japan released the captain in such an abrupt change of stance? IMO, as I wrote in Chinese a couple days earlier, there are two plausible explanations. (1) that the local prosecutor did reached this decision on his own, based on the circumstantial evidence; (2) that what Kan perceived was the determination of the PRC government in even risking a lose-lose fight in this issue, as it directly challenged its legitimacy domestically. 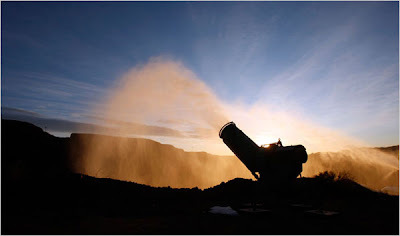 "Rare Earth Elements: The Global Supply Chain,"
"Rare Earth Materials in the Defense Supply Chain,"
China's Rare Earth Elements Industry: What Can the West Learn?" Rare Earth Elements are essentially group IIIB elements in the periodic table. Being in the same group means having similar electronic configuration (in Neils Bohr's orbit paradigm) and hence similar chemical properties. 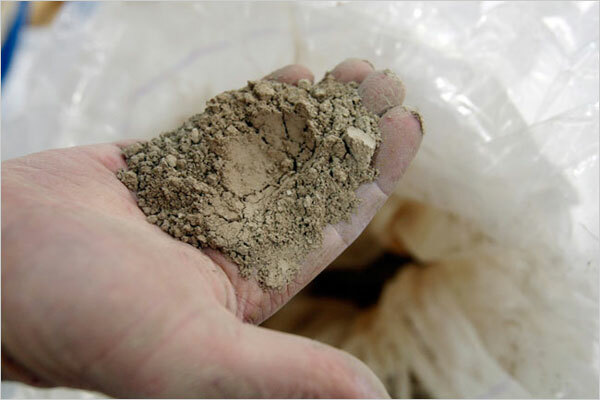 The official definition of Rare Earth include only the lighter elements, i.e. the periods (rows) 4-6 of group IIIB, although the 3rd set (period 6) actually contain 15 siblings, the lanthanides. 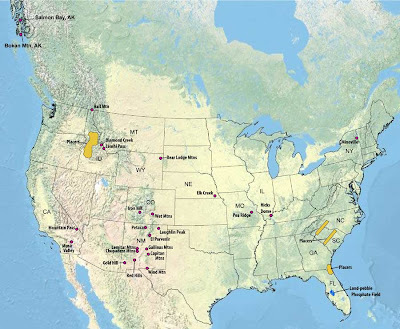 The heaviest IIIB group, the actinides (period 7), which are mostly radioactive elements, are not referred to as "rare earth", though one would expect similar chemical and physical properties, they are unstable. Since the chemical properties are very similar (and physical properties such as weight as well for the lanthanides), they are also very hard to be isolated by chemical (and physical) methods. The closeness in electronic configuration also means there are fine tuning in terms of their properties -- which made it easy for scientist to test hypothesis on the material properties, e.g. if one element is found to demonstrate certain property, with some undesirable defect, chances are that the neighboring element may demonstrate the similar property, and with luck, with that defect improved. -- one technical detail, the lanthanides all have similar chemical properties despite the fact that the "exterior shell" electron number ranges from 0 to 15, is because this supposedly "exterior shell" got attracted into somewhere deeper, making the 2nd outermost shell the outermost shell. 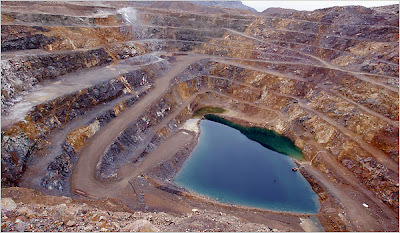 The now mostly well known Mountain Pass mine (shut down but will be re-opened) in California is located midway between Los Angeles and Las Vegas on Interstate 15, about 15 miles before the State border at Primm. If you have drove passed that route, you may remember a sharp elevation passing a mountain on the Mojave Desert, that mountain pass is called the "Mountain Pass". Molycorp is located east of the highest elevation (at around 4600 feet) point -- the pass. 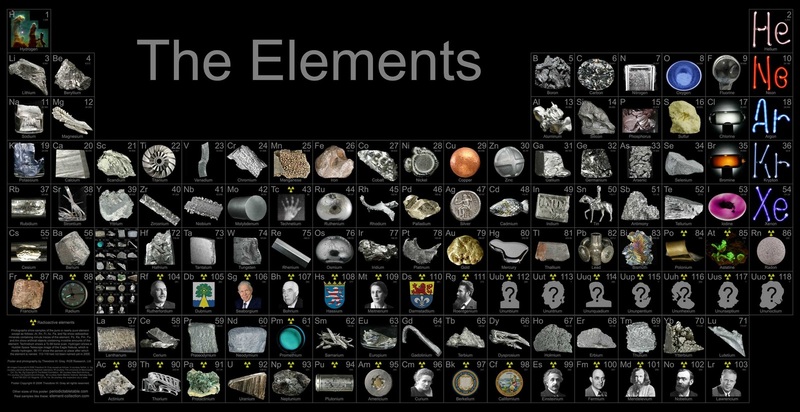 The chart above shows only 16 of the rare earth elements. The one with perhaps the most romantic (or Hellenic indeed) name, Promethium, is missing. Because this is the only element that is radioactive, hence unstable (actually very unstable - 17.7 year half life), and hence had decayed over the years and cannot be found in nature any more. 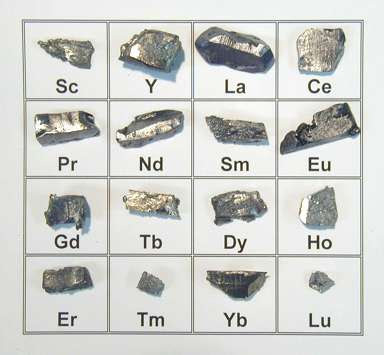 The chart below shows some rare earth elements plus some accompanying elements typically also found together in rare earth mines. ..and a very informative article by National Geographic. 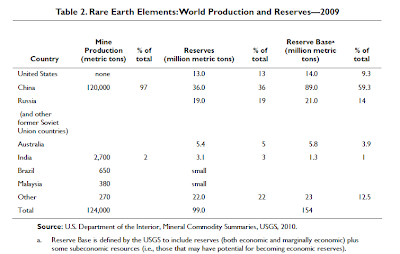 Here is the chart of world reserve and production in REE, from fas.org .